Jura Island harmony singing week April 18-25 2011. Join us on this beautiful Scottish island where we are staying at Ardlussa House, in the wild northern end of the island, with beside the sea and wooded coastline. 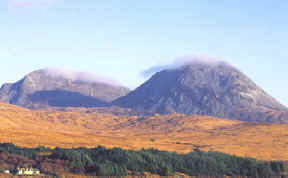 The northern end of Jura is famous for the home of George Orwell at Barnhill and the Corryvrekin Whirlpool. The rooms are all single, double and twin. Cost for the whole week including food, accommodation, workshops, learning videos etc. is £350 per person in a double or twin room. £395 in a single room. As this week is oversubscribed we have also booked extra accommodation on the island of a very high standard so that we can offer extra places - all meals and workshops will be in Ardlussa House. Jura is famous for having 5,000 deer, 150 inhabitants and one distillery. It also has one pub (Jura Hotel), one village shop, and now two ferries from the mainland (Cal Mac via Islay and a smaller service seating 12 to Craighouse. 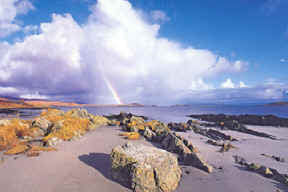 The island is also famed for its folk music with a very well known ceilidh band and many smaller groups. 10 per cent of the island sing in the Jura choir (imagine what that would be like in London.) 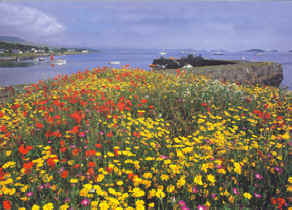 There are countless deer, otters, eagles and wild flowers....and a pace of life which has long since passed on the mainland. Ardlussa house is the jewel in the crown of Jura - and has a beautiful garden, and also walks down through the woods to a quiet beach. We often see seals and otters there, and when walking in the hills see eagles. It's not unusual for us to be eating dinner in the house and a giant stag to appear at the window - although the estate tries to keep the deer away from the house because they eat the garden. The rooms are all single, double or twin rooms furnished with antiques. We will be learning songs from Scotland and around the world and singing them at informal singing events in the little village of Craighouse at the end of the week. I will be sending out some music beforehand for singers to prepare before coming to the island so that we are ahead of ourselves (especially the Gaelic songs so singers can familiarise themselves with the language.) I also hope to teach some songs in Scots. We will also meet up with singers from the island's choir. There will be singing workshops every day which will include a voice warm up, rounds and longer songs in 2, 3 and 4 part harmony. The teaching will be by ear - but written music can be provided. We have again invited our friend and native Gaelic speaker Mairi Carmichael to join us from Islay to help us with the Gaelic - we also have recordings of her speaking the words for us at previous singing events. We will have the opportunity to sing in a concert in Craighouse. The food will be vegetarian, and also meat dishes. Some assistance with serving, clearing and preparation will be requested during the week. We can arrange shared lifts (singers in the past have come from as far away as Sussex, San Fransciso and Sydney!) - and others are meeting in Cumbria to break their journey and to share lifts with local singers coming to Jura) - both on the mainland and on Jura. We will be taking the Cal-Mac lunchtime ferry from Kennacraig on the Scottish mainland (about 50 miles south of Oban) to Port Askaig on Islay. The Jura ferry goes from the same pier and takes about 5 minutes to cross the sound to Feolin on Jura. The Jura bus can then take you the 30 miles to Ardlussa House (it serves as the school bus for school children living in the north of the island) - or you may wish to bring a bicycle to make travel easier on the island. 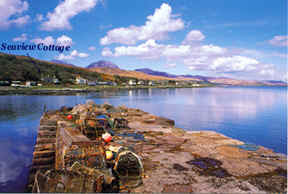 The village of Craighouse is about 25 miles from Ardlussa House. The rooms are either single, double or twin. The cost for the whole week including accommodation, meals, workshops, etc. is £350 if sharing a double or twin room, and £395 in a single room. To book please make cheques made payable to David Burbidge please - though please ring or email first to makes sure that a place is available. When booking please include your name and address, home and mobile phone numbers, and email address to my address below (David Burbidge, Smithy Cottage, Farfield, Sedbergh, Cumbria LA10 5LW Tel.015396.21166 email davidburbidge@hotmail.com .) A £50 deposit will secure your place - which is repayable until January 1 2011. The remainder is due by February 1. Deposits are fully refundable up until January 1, after which we reserve the right to keep your deposit. The balance must be paid by February 1, which is also refundable (minus the deposit) up until March 1 - after which we reserve the right to keep your full booking fee. If you are still uncertain then if you will be able to join us we suggest taking out holiday insurance which will allow your booking fee to be refunded through your insurance if for an appropriate reason you have to cancel. All bookings are fully transferable - ie. if you find you cannot go, you are very welcome to find someone to take your place as long as they are fully aware of the nature of our week together and you have transferred all the relevant information to them. If the course is unsubscribed we reserve the right to cancell the event up to 5 weeks before a weekend, and up to 8 weeks before a week long course. LIFTS SHARES We will soon be arranging the lift shares as there are many singers going from the North West - please let me know if you would like to offer a lift - or if you would like to receive one. Travel costs will be shared between those giving and receiving lifts. If travelling by public transport - you may wish to take the train to Glasgow and then catch the 9am coach to Kennacraig (it goes on to Campletown) - the ferry will often wait if this bus is delayed. You can then join us on the ferry to Port Askaig - and on the smaller ferry to Jura, where the Jura bus and my car will be waiting to transport you and your bags to Jura House. The bus costs about £2 and drops you at the end of the drive - I can arrange to collect your bags in my car.